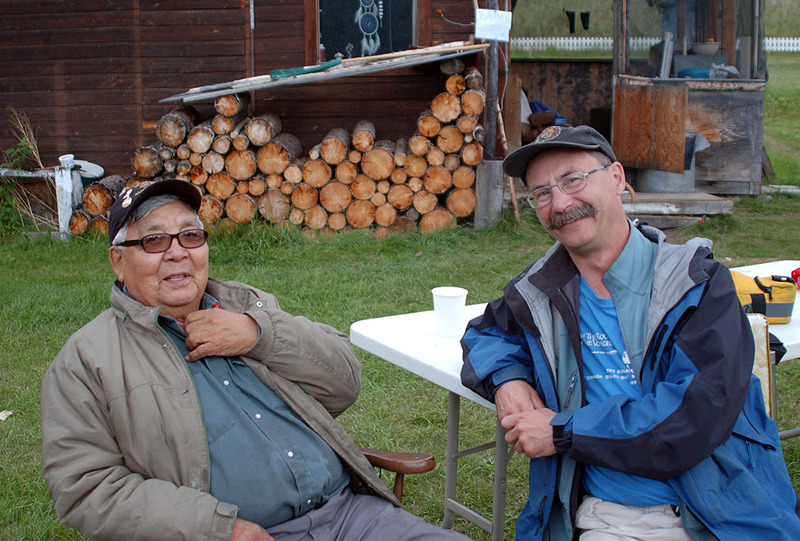 Moosehide Percy Henry speaking with David Neufeld. Photo Courtesy of D. Neufeld. For some 30 years I’ve lived in, travelled and studied the Upper Yukon River basin. Environmental history, with its acceptance of pluralism, has been an important element in the historiographic evolution of my approaches to the river valley and my interest in making a relevant history of place. In the mid-1980s I started work as the Yukon historian for Parks Canada. Among my first assignments was training the interpreters of SS Klondike National Historic Site, a restored 1938 Yukon River sternwheeler in Whitehorse. While the technology of wood-fired steam engines and the apparent luxury of china place settings in the vessel’s dining room evoked a romantic past, the primary theme was Metropolitanism – the extension of government and corporate agency into the Canadian North and the exploitation and carriage of valuable natural resources to the Outside. A few years later, when our children were big enough to climb into a canoe, our family began a series of annual trips along the same river the SS Klondike had sailed. The powerful current of water and the wide river valley, only subtly modified by humans, provided a sharply contrasting experience to my assured presentations on northern development. Rather than trying to explain the Canadian economy and the related national geographic destiny, attempts to do so on our trips were met with groans, our daily challenge was to find a “home”, a place for our family to spend the night. Sometimes we found a good camp, but, in the early trips, most nights were just buggy, inconvenient, and bushy. We soon learned to look far ahead to plan a stop. Delay a decision and you simply swept past the good spots. It was impossible to go back upstream. So when we saw tall spruce or pine ahead, we ferried over to that side of the river and looked for a beach or a telltale footpath worn into the river bank. Gradually we came to a deeper realization, the “good camps” in the spruce also offered either morning or evening sun, there was often a fresh water side stream nearby, usually there was a makeshift table between two trees and a set of stumps around a fire pit. We learned too that these “good camps” were places where people had previously lived, hunted, fished, cut wood for river boats, like the SS Klondike, and, in many instances, still did the same things through the year. These “good camps” were homes. I set aside my regular and extended visits to the National and Yukon archives and began to visit with the people who used the river. In February, 1992 I worked with the Tr’ondëk Hwëch’in, the First Nation in the Dawson City area, to host a First Nation Yukon River meeting. Despite -40o temperatures Chief Isaac Hall was packed with First Nation elders, leaders and fishers along with a couple of museum and CPAWS staff. The presentation by the Yukon’s representative to the Historic Sites and Monuments Board of Canada on the commemoration of Beringia contrasted sharply with the personal accounts of river travel, subsistence activities and storytelling. While the difference was obvious, equally clear was that neither was a pronouncement of the Truth, rather both were stories of meaning, one about place, the other of place. For the next decade I struggled to see how these different stories could connect with each other. Where could western historiography offer useful insights or reinforce or elaborate on locally defined interests? Following upon the lead of an activist dramaturge and community artists and dancers who helped local stories to emerge (Lippard, p267), I learned to sit and listen before beginning any work. Over time I gained a basic understanding of the depth and character of the First Nation’s stories of meaning. From 1998 to 2003 I led a joint First Nation/government working group to prepare a cultural value statement and management plan for a Tr’ondëk Hwëch’in historic site, one of Canada’s obligations under the 1998 treaty. Periodically I presented my understandings to the community. While always politely received it was still more than a decade before I was given a passing grade by elders. By 2003 I was ready to return to the investigation of western approaches to place. I researched the history of the Linnaean taxonomic system during a sabbatical at the Scott Polar Research Institute. Subsequently I investigated the role of government in the commemoration and presentation of Canada’s past and environment and my responsibilities therein. Both are used as applied abstractions to create a universal frame for understanding the world. Both however are carefully crafted cultural responses to environmental and social interests set in Western thought. In the culturally diverse Yukon Territory (and Canada), with its recently signed treaties between Canada and a dozen First Nations, imposed and exclusive narratives of meaning are problematic. Environmental history, with its assumption of distributed agency, helps place abstractions within their cultural context and thus makes it possible to imagine the respectful and equitable pluralistic society described in the treaties. Presently my historical research sets aside questions of the intent of policy. Instead I attempt to describe actual land practice and cultural interactions. That is, to see how government officials, corporate managers, aboriginal people and others responded to the environment they lived within. Did they figure out where the good camp sites were or did they float past them into the dismal bush? Liza Piper’s recent work on health programs in the Yukon appears to be taking a similar approach. I’ve also started to look at how other disciplines seek out meaningful narratives. I invited Nicole Bauberger, a Yukon artist interested in people’s responses to place and journey, to do a Yukon River residency with me. In August, 2011 we spent a week travelling a portion of the upper Yukon River, Nicole painting and I considering her approach and direct engagement with place. 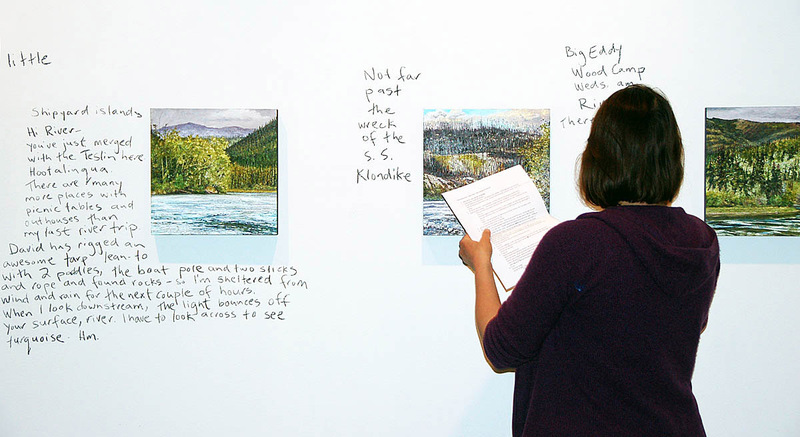 Together we recently mounted a show, Traversing Yukon Landscapes, at the Yukon Arts Centre. Environmental history has helped me situate these Western and Indigenous narratives and practices of place to gain a more complete understanding of how we live together here. Traversing the Yukon, May 2013. Photo Courtesy of D. Neufeld. David Neufeld is an environmental historian in the Yukon. He studies the intersection of knowledge and practice in both Western settler approaches to Canada's North and Yukon First Nations' ways of life in their sub-arctic boreal homelands. His reflexive research approach is grounded in 40 years as a cultural researcher engaging with Indigenous communities on their traditional lands. His complementary travel with both “hunters” and “miners” has made him sensitive to the character of the contact between Indigenous and Newcomer through the 20th century and their changing expectations of each other. He sits as the community representative on the Yukon University Research Ethics Board and previously taught Canadian Northern history and protected area management. He also supports Yukon-based internships of M.A. and PhD. candidates (Univ. of Alaska - Fairbanks, Northwestern University, Ludwig Maximillian Universitat, University of Cambridge, University of Vienna) in Yukon research.